Technology is all around us and our students are emerged in technology every day. It’s inevitable that our curriculum should also be teaching students things like staying safe online, about online bullying and technology, and so much more. 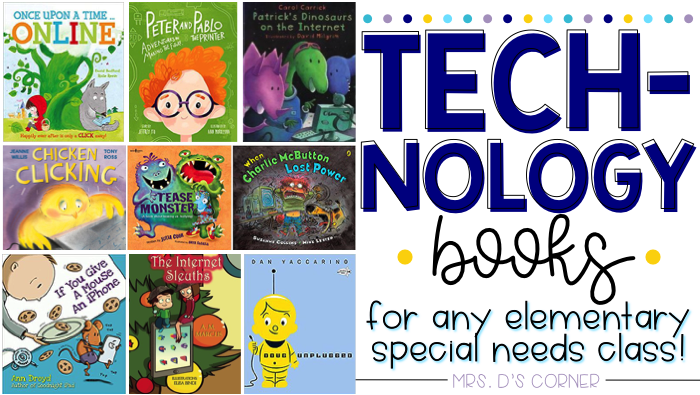 Below are 30 great technology books for kids filled with learning, fun stories, and great illustrations on the joys and cations of technology. When Charlie McButton Lost Power is a hilarious story about young computer addicts and those who love them. Webster’s Email is a fun a witty story about little spider and how he begins to regret emailing a funny picture of his sister. Webster’s Friend is a story about Webster the spider! He thinks he’s made a friend online and things take a turn when the friend wants to meet in person. A story told in playful rhyme, this one is a great story to help kids learn about internet safety! Webster’s Manners is a story about Webster the spider learning about manners and learning to be polite with technology. Read along this cute and fun book as he learns how to take care of his favorite gadgets and toys. Webster’s Bedtime is a cute story about a spider’s bedtime – but first, he has to help all his electronic gadgets get to sleep. Goodnight Selfie is a story about a girl who gets her brother’s hand-me-down camera phone. But It’s Just A Game is a story about a boy who is complete absorbed with playing video games and helps teach kids about the importance of creating a healthy gaming balance. The Technology Tail: A Digital Footprint Story is a great book for young readers on how from a young age, they are creating a digital trail that can’t be erased. Tease Monster: A Book About Teasing Vs. Bullying is a great book to help children understand the difference between teasing and bullying. Chicken Clicking is a wonderful book on teaching children how to safe online. Tek: The Modern Cave Boy is a hilarious and heartfelt story about how technology can take us backwards. Troll Stinks is a story about Billy Goat and his friend Cyril are playing with the farmer’s phone and find a number for a troll. Read along to see what they do when they find his number! Once Upon a Time… Online: Happily Ever After Is Only a Click Away! is a fun an quirky story about what happens when fair-tale characters receive a laptop and learn a lesson in online safety. Cell Phoney is a great book about learning some important rules on cell phone usage safety! Kids will learn these through the story of Joanie receiving her very own cell phone, but her mom requires her to complete a Cell Phone Safety Course first! Goodnight iPad: a Parody for the next generation is a humorous parody that pokes loving fun at the classic it’s inspired by and our modern tech-filled lives. If You Give a Mouse an iPhone: A Cautionary Tail is a cautionary tale on the perils of our tech-obsessed lives through this fun and engaging story! One that all kids are sure to enjoy! What Does It Mean to Be Safe? explores various safety issues such as physical, emotional, social, and cyber safety in ways that spark meaningful conversations between kids and adults. The Internet Sleuths: Picture Book about Keeping Children Safe Online is a great book offering entertaining and effective ways to help teach kids about internet safety. But I Read It on the Internet! is a story about two students doing research on the internet about information they can’t seem to agree on. Bully is a story about feeling left behind by friends and cyber bullying on Facebook. Dot. Is a fun and bright story about a little girl who is very knowledgeable in electronic devices. Read along this bright and fun story – one kids are sure to enjoy! Grace Hopper: Queen of Computer Code (People Who Shaped Our World) is a fantastic and inspiring story of Grace Hopper. Filled with witty quotes and richly detailed illustrations, this book brings Hopper’s amazing accomplishments to life. Little Bird’s Internet Security Adventure is a story about Little Bird helping her friends stay safe while using the internet. Hello Ruby: Journey Inside the Computer is a story about Ruby and her search for the missing Cursor! Nerdy Birdy Tweets is a story about two friends who are very different. Read along this fun adventure – one sure to be enjoyed by all kids! hello! hello! is a book about a girl who tries to say hello! to all those around her, but they can’t hear her because they are so busy with their gadgets. So she ventures outside and discovers lots of fun things to say hello! to! Doug Unplugged is a funny story about Doug the robot and how sometimes the best way to learn about the world is to go out and be in it. Cyber Safety Simply: A Cautionary Picture Book is a picture book about using the internet and stranger danger. Patrick’s Dinosaurs on the Internet is about Patrick’s great adventures! He loves looking at dinosaurs on the internet but he had no idea that they were looking back! Read along his adventures in the fun and humorous book! What technology-themed books would you add to this list?